Help save one of the American Revolution's most critical battlefields! There are very few physical places left that tell the story of America's founding era. Time devoted to teaching history is dwindling, and developers are bulldozing these lands to construct housing on hallowed ground. But today we have an opportunity to reverse this trend. 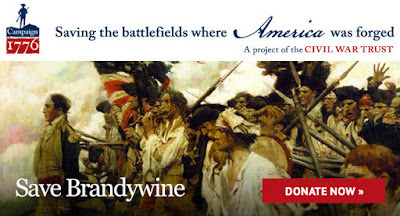 Together, we can help save land at Brandywine battlefield. This 10.4-acre plot is located in the middle of two major combat zones at the site of the longest one-day battle of the Revolutionary War and the first battle where a young Marquis de Lafayette played a defining role. This property provides an invaluable opportunity to preserve the land and teach the public about the importance of the sprawling battle that took place here in 1777. The Battle of Brandywine was an 11-hour slug-fest in which Washington's men went toe-to-toe with the powerful British Army. Though the Continentals were ultimately defeated, the fierce and determined performance of Washington's men ultimately convinced the French to support the nascent nation in its war for independence. Fast-forward a few centuries, and this land is located within a wealthy suburb of Philadelphia and has been advertised as "an unparalleled opportunity" to build a McMansion. We can't let this happen. Thanks to grants from other organizations and a generous donor, we can save this key piece of battlefield for future generations at a cost of only $45,000. This is an astonishingly small amount for such an important part of American history. Will you please help us reach the finish line? What's more, if you help with a gift of $50 or more, you will receive a Special Preservation Edition hardback copy of Brandywine: A Military History of the Battle that Lost Philadelphia but Saved America. Thank you for your generosity and unwavering commitment to the cause. It's people like you who keep our history alive for generations to come.